WASHINGTON (CN) – Senators drilled Monday into the findings of last week’s watchdog report detailing the Justice Department’s handling of the investigation into Hillary Clinton’s private email server, with Republicans pointing to political text messages as proof of bias and Democrats noting the report says nothing of the ongoing Russia investigation. Members of the Senate Judiciary Committee peppered Justice Department Inspector General Michael Horowitz and FBI Director Christopher Wray with questions for more than three hours on Monday about the findings in the 500-page report the inspector general’s office released last week. In a prepared opening statement, Horowitz detailed the process by which his office compiled the report, and reiterated its core finding that there is no evidence the department’s decisions related to the Clinton email investigation, referred to in the report as the midyear investigation, were tainted by political bias. “Within this framework, as to the specific investigative and prosecutive decisions we reviewed, we did not find documentary or testimonial evidence that improper considerations, including political bias, directly affected those specific decisions, in part because the decisions were made by the larger midyear team or the prosecutors,” Horowitz said. The highly-anticipated report faulted former FBI Director James Comey for his public handling of the email investigation, determining he acted insubordinately when he kept then-Attorney General Loretta Lynch in the dark about his plans to hold a press conference announcing the FBI would not recommend charges against Clinton for her email practices. Horowitz, however, said the findings in the report should not be “extrapolated” to other investigative decisions. He specifically said the office “did not have confidence” that there was no political motive behind the decision to prioritize the department’s probe into Russian attempts to swing the election for President Donald Trump ahead of its investigation into Clinton emails discovered on Anthony Wiener’s laptop. Horowitz said texts between FBI agent Peter Strzok and FBI attorney Lisa Page that included anti-Trump sentiments and talk of work to “stop” Trump from becoming president cast a “cloud” over the Clinton investigation. “I can’t think of anything more concerning than a law enforcement officer suggesting that they’re going to try and use or may use their powers to affect an election,” he said at the hearing. The report has become a political Rorschach test in the days since it was released, with Democrats and Republicans both pointing to its findings to support their previous claims about the Justice Department’s handling of both the Clinton email investigation and the investigation into Russian interference in the 2016 election. Democrats cited the findings as support for the contention that Comey’s decision to publicly announce the closing of Clinton’s investigation, only to announce its reopening in a letter just days before the election, was a breach of department policy. Meanwhile, Democrats have also noted the investigation does nothing to impugn Special Counsel Robert Mueller’s investigation or show a government conspiracy against Trump. “As we consider this report, let’s not lose sight of the fact that the IG found no evidence that the FBI and Justice Department are politicizing investigations and nothing warrants the attacks that we are seeing on the FBI, the Justice Department, or Special Counsel Mueller’s investigation,” Senator Dianne Feinstein, D-Calif., said at Monday’s hearing. Meanwhile, Republicans have pointed to the Strzok texts included in the report as evidence that the FBI is biased against Trump. Horowitz characterized Strzok’s role in the department as essentially leading the Clinton email investigation and Strzok later worked on Mueller’s team but was removed after the text messages surfaced. While Horowitz was critical of the Strzok text messages, he made clear the inspector general report only involves the Russia investigation in the sense that Strzok is a character in both. While he avoided commenting directly on Trump’s claim that the report exonerated him, Horowitz noted the investigation did not touch on the question of collusion between the Kremlin and the Trump campaign. “We don’t go into any issues related to the Russia investigation beyond what I mentioned,” Horowitz said. 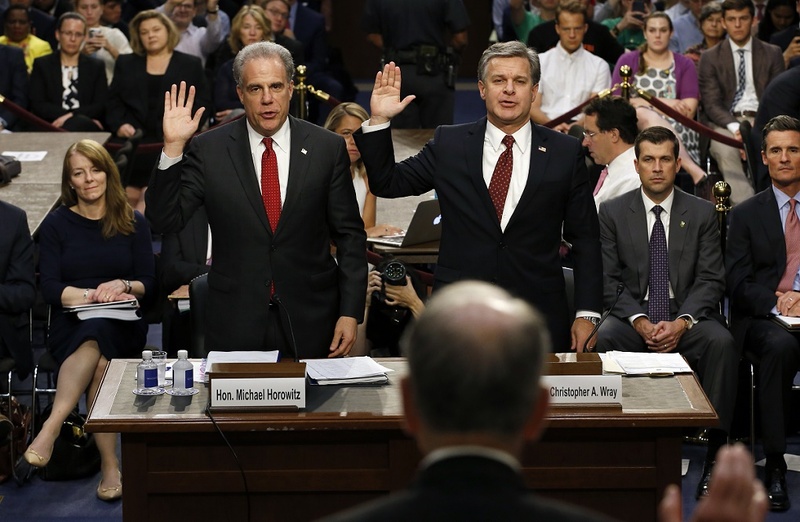 For his part, Wray told the committee the FBI under his leadership is already taking steps to tighten policies on agency employees speaking with the press and on how the department conducts politically sensitive investigations. “The OIG’s report makes clear that we have significant work to do and as I said, we’re going to learn from the report and be better as a result,” Wray said.